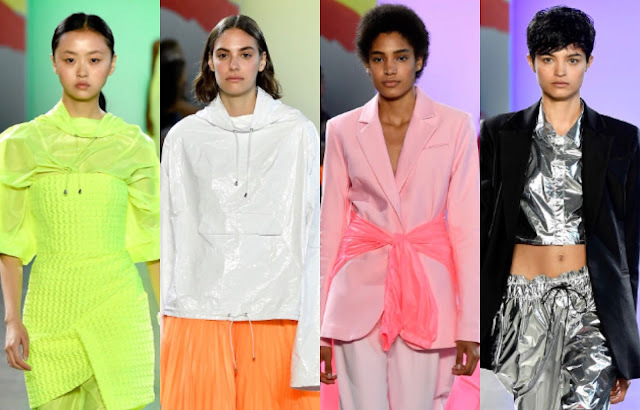 Neon Dreams At The MILLY NYFW Spring '19 Runway. New York Fashion Week Is Always So Much Fun! 'MILLY' strutted a glorious collection down the runway called "Metamorphosis". Fashion week is always amusing to follow because it serves as a big source of inspiration for my personal style. Even when it looks like I can't wear some of the clothing straight off the runway, I still get inspired by the colors and texture. One brand I can always relate to and have admired for quite some time is 'MILLY'. "She's vibrant, exciting," Smith said of "The Milly Girl." She's confident, empowered, beautiful inside and out," she explained to AOL Lifestyle. Her SS19 collection is about transformation and being able to evolve at any stage of your life. The runway displayed a variety of different silhouettes, color blocking, metallic suits, neon galore, and unique mixing and matching. Here are some of my favorite pieces below.